Oxford Health staff celebrate outstanding work done by colleagues. It was a night of celebration last night (30/11) as staff from across the trust turned out to celebrate some of the remarkable work going on here at Oxford Health at our annual Staff Recognition Awards. 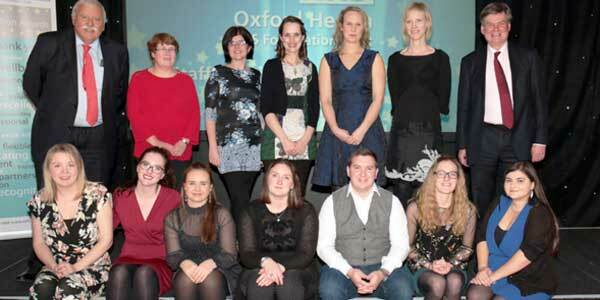 The awards, which were re-launched two years ago, have become a popular annual event here at Oxford Health, with this year’s awards seeing more than 170 nominations made across the five counties we serve. There was also one special award presented on the night, our Improving Patient Experience Award, which is only open to patients and their families, friends and carers. Chief executive Stuart Bell CBE (pictured on right, with award winners) who hosted the event and handed out the awards to staff, said he found the work of those who had been nominated for awards “inspiring”. “The quality of the nominations for this year’s awards was very high and I think everyone who was nominated for an award this evening should be very proud. Given to an individual or team who have consistently demonstrated a high quality of care for our patients and service users, this year’s winner was Georgina Little a primary mental health support worker, working within our CAMHS Community services in Wiltshire and BaNES. Her nomination described her as an “inspiration” and someone that “always goes the extra mile” to support and care for the children and families she works with. The nomination went on: “She always considers her client’s feelings and works in a collaborative way to support them in working towards their goals. She always remembers to ask you how you are and knows when you need a kind word even when you are busy. This award is to recognise an individual or team who has made improvements to safety. This can include the use or development of innovations in equipment, process or electronic systems. This year’s winner is Zoe Dallow an occupational therapist within our Learning Disabilities Service. Zoe introduced an epilepsy sensor to health and social care which has promoted patient safety in the community. By recognising a gap in the care we provide our clients, Zoe’s work has seen vitally important information being made available to clinicians in a way that had previously been hard for the client to do. This award is given to an individual or team that strives to be the best they can be and who is committed to leading the way. This year’s winner was Jo Preston, a physiotherapist working within our Physical Disabilities Physiotherapy Service. Jo created an innovative exercise programme pilot which has demonstrated an improvement both in physical function and psychological wellbeing in participants. Off the back of her work, there are now five Big Bold and Balance programs delivered in Oxfordshire by Age UK Fitness Instructors and trained by the Physical Disabilities Physiotherapy Service. These awards are given to those teams who demonstrate a consistent ability to improve the quality and experience of the care we provide for our service users, their families and carers and their fellow colleagues. The winner of the clinical Team Work Award this year was the Medicines Information and Clinical Effectiveness Team. The team was also recently rated excellent by the national professional body for medicines information (UKMI). This year’s non-clinical Team Work Award went to the Dental Referral Bureau who were likened to Google in their nomination. This team provides support to a service of 70 clinicians across the trust’s 10 dental clinics in Oxfordshire and deals with more than 1600 referrals a month. There are three values at the core of everything we do at Oxford Health, those of being caring, safe and excellent. The Living the Values Award goes to the individual that has demonstrated an outstanding commitment to these values. This year’s winner of the Living the Values Award is Noel Burke a behavioural nurse specialist within the Learning Disabilities services. Noel was praised for his caring and supportive approach to his work and tireless approach to ensuring that those people who need care and support have it. Our Wellbeing Award is given to an individual or team that has encouraged others to live healthier lifestyles. This year’s winner is Jo Mildenhall an administrator with our CAMHS Community Services in Wiltshire and BaNES. Jo’s colleagues described her as a fantastic motivator who, not matter what her day has been like, is always available with a kind word. Our Improving Patient Experience Award is nominated by those that come into contact with our services and given to the person who has made a real difference to their experience of the care we provide. This year’s winner is Beatrice Anastasiou, a speech and language therapist with our Learning Disability services. Has one of our staff members or teams made a real difference to your care? Find out how you can nominate a staff member or team for the Improving Patient Experience award.